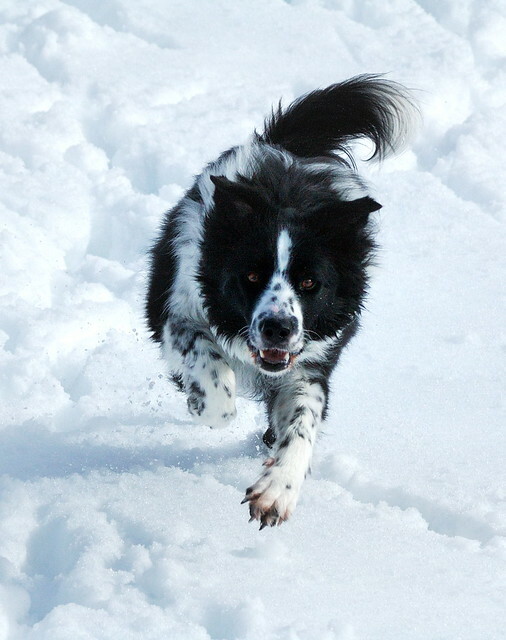 Photographing a black and white dog against snow can be challenging. Photographing two black and white dogs who have not had a good run all day, and who are therefore quite manic, while attempting to try out a new 55-200mm telephoto (Nikkor 55-200mm VR, in case you’re interested) lens in the snow on a sunny day without checking the ISO setting was probably quite close to foolish. The results of the lens were great for the lighting conditions, particularly when considering that I was trying to throw a stick with one hand and operate a camera with the other. I did do a small amount of lightening this photo up, especially on her face, since her brown eyes don’t contrast much with her black mask. Note to self: always revert ISO setting to 200. Clearly you cannot be counted on to check before shooting, so please, Self, check AFTER. Previous Post In the name of France, I claim this shed…..
Beautiful picture. My wife and I had a pair of border collies up until this past week when the geriatric “sister” passed away. May not be long before we “rescue” another border collie, since one is wonderful but two is even better! Oh, and it’s delightful seeing how they react to the snow!